I had another doctor's appointment today. Baby and I are both doing good. The baby is all ready over a pound and is growing every day. Heart rate was still around 151, lots of movement again, all around, a good check-up! I had a plan last night to try a layout without layering paper (which is my usual go-to scrapbooking game plan) and had some success. 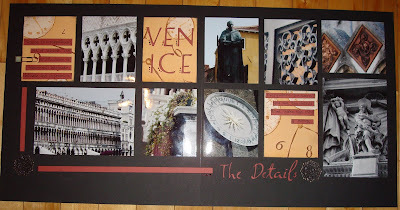 I took a lot of close-up pictures of the detail in Venice so I made a layout about that. Lots of photos and not much paper. Only layered the title and the journaling I guess, but for me, that's pretty impressive. I did this while watching the season finale of Lost. Anyone watch it? I thought it was really good and what a cliff hanger!